Do you fancy the idea of wandering through the streets of the Spanish capital without any stress and without the fear of getting lost? No problem! With our marvellous Official Guide, you will be able to stroll around the city without a care in the world as you enjoy listening to the city's intimate details first hand. You will be able to visit the most famous attractions without missing out on anything as well as being able to enjoy a wonderful stroll around the city. An Adult ticket costs €52.00. Children from the age of 6 are charged €39.00. There is no charge for children under the age of 6. Visit the Madrid of the Austrians, the Royal Palace and learn about the history of the Spanish kings. 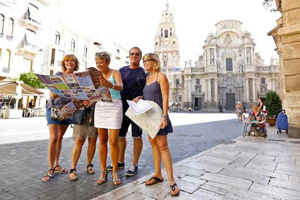 On this Tour, you will get to learn in detail about Spanish royal history. Your guide will take you to the Royal Palace, the royal family's official residence, which covers some 135.000m² . This is also sometimes referred to as the Eastern Palace because of its location and here, you will be able to enjoy the Palace's spectacular art collection. You will be able to admire a Stradivarius violin and works byGoya, Velázquez and many more as well as impressive furnishings and other objects from the daily lives of royalty such as fine china and clocks. The Plaza Mayor, at the heart of the House of Austria, right in the centre of the city, will take your breath away with its detailed architecture. Your attention will be drawn to the statue of a man on a horse who is no other than King Philip II himself. Then there is the majestic Casa de la Villa, a beautiful palace made out of granite which is the former location of Madrid's City Hall but nowadays, only used for official events and receptions. And of course, you will be able to stop wherever you like and whenever you like, not forgetting that you can also take the opportunity to enjoy a drink which is included in the tour. What more could you want? Availability: Every day from 10:00 to 13:00 hours.